This amazing Villa on First Avenue Mount Lawley is situated 500 meters from an array of cafes, restaurants, boutiques, pubs & supermarkets on Beaufort Street it is classed as the social scene hub of Perth's elite & best strip Perth has to offer. A MUST VISIT is 'So Last Century, Cnr of Beaufort Street and 2nd Avenue. This store has amazing retro furniture and collectors items for sale. The Italian restaurant opposite is also very good . Bus stop 2 min walk and 10 minutes to Perth city every 5 mins or a 20 minute very interesting walk, stopping at Perth museum or the Art Gallery in Northbridge. On your way, enjoy and explore China Town with oh so many delightful Asian restaurants. IGA is located on 2nd Avenue, (3 minute walk) with oodles of quality made meals and an amazing selection of daily needs. Best in Perth. You'll love the convenience of being moments from Perth College, Forrest Park and Beaufort Street yet still able to stroll to the Swan River and Claisebrook Cove. The apartment also sits conveniently within the high demand catchment area of Mount Lawley Primary and High schools. If you're not already familiar with Mount Lawley, then all you need to know is, the lifestyle is addictive. This is a suburb that spoils you for renting short stay anywhere else, in short, you've found your forever short stay rental! 2 bedrooms and bathroom, suitable for 3 people. Sheridan linen and bath towels. Accommodation in complex of 5. Gourmet kitchen with pantry of essentials and convenient food for late arrivals. The villa now consists of a cleverly designed black and white upmarket kitchen with top end appliances including a fridge, microwave, dishwasher, black glass gas hotplate and electric oven and a new creative laundry area behind 2 glass sliding doors which was the toilet. The bathroom had a complete face lift with full height white tiles and feature black tiles in the walk in shower with new vanity and toilet. On entering the secured villa there is a lovely courtyard with a 3 piece outside lounge The garage with new remote controlled roller door is within the walls of the villa accommodating a small to medium size vehicle. . The main bedroom consists of a queen size ensemble, double wardrobe with mirrored sliding doors, bedside table with lamp and refurbished chest of drawers. The 2nd bedroom consists of a single bed, refurbished bedside table with lamp and chest of drawers. There is a covered drying area directly off the kitchen which has a new glass door which allows light into the kitchen area. Please note: We have just uploaded new photos, there are a couple on their side, endeavouring to fix as soon as possible. Smoking only permitted in the courtyard. Guest access is by meeting with the owner or representative. The latest check in is strictly 7pm or arrangements can be made to leave keys and remote in a secure place. Only people registered may stay in the property. Photo ID required on arrival. I;ve been renting short term properties over the last 11 years, owning 2 and managing 3 other properties for friends and relatives. First started with Stayz Australia which was extremely successful. I was brought up in Applecross in Western Australia which is a riverside suburb. Had a wonderful upbringing especially peddling to the river with friends during winter and summer. I attended Applecross Primary School which was just 1 street away and then attended Kent Street High School in East Victoria Park for 3 years then to Underwoods Business School. After my first job I travelled to London when quite young on a working holiday for 3 years. Came home to get married and have 2 daughters and now 5 grand daughters. TGhe reason for buying this property is that it is in a highly desirable and upmarket area which is only 3 kms direct to the city. Choosing the property was the proximity to the city. The property was a challenge to gut and renovate. Very happy with the outcome which was a huge task. Secured lock up garage with new remote roller door inside the property. There is a wifi machine at guest cost. Tea, coffee, sugar, etc for use. 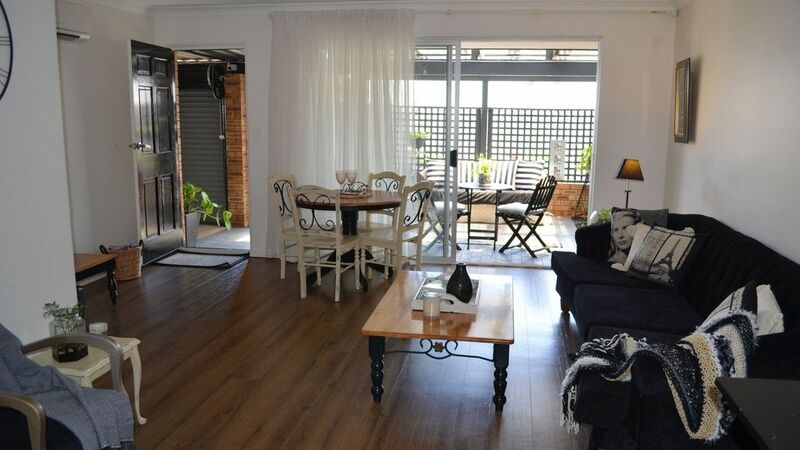 The villa in Mount Lawley is very convenient to the city with bus stop 2 minutes away and buses pass every 5 minutes which takes 10 minutes to the city of Perth with cultural centres, Bell Tower, Elizabeth Quays and Kings Park within easy reach. IGA supermarket is on cnr of 2nd Avenue and Beaufort Street which is only a 4 minute walk. The house is very cozy and beautiful, perfect for a family of three. Ideal location, shops and cafes nearby and very near to the city. The house was very clean and newly furnished, true to the pictures given. Had a great stay with my family and would highly recommend! Great size and location, easy walk to shops and close to a great park. Was a very handy place to stay for a week. Had everything we needed and was really good value. Has just been renovated, so fresh and modern inside the unit.